The Mesolithic is commonly defined as the period between approximately 10,000 and 4,000 BC, that is, from the start of the warmer Holocene interglacial (c. 9,750 BC) to the emergence of more settled farming communities during the Neolithic. As at the start of previous interstadials sea levels were considerably lower than at present during the Early Mesolithic. At this time Britain was connected to the continent and the southern North Sea basin was a vast expanse of dry land; the area now commonly referred to as ‘Doggerland’. The environment of southern Britain changed considerably during the early stages of the Holocene as temperatures rose and the land was colonised by new plant, animal and insect species. Over time, landscapes which had previously been largely open became increasingly wooded, with the pioneer tree species such as pine and birch being replaced by mixed deciduous woodland in which new species such as oak, hazel and elm dominated. The archaeological evidence for Mesolithic activity consists primarily of lithic artefacts, although there are a number of sites which have produced clear evidence for the use of a wide range of implements made from wood, bone and other organic materials. Associated archaeological features and deposits are, however, relatively rare across the country as a whole, although pits, hearths and the traces of fairly ephemeral structures are occasionally encountered. The flint technologies employed by the hunter-gathers of the Mesolithic are quite distinctive and represent a refinement and miniaturisation of the techniques seen during the preceding Late Upper Palaeolithic. The principal focus of these industries was the systematic production of small blades and bladelets, many of which were broken down and carefully retouched to make microliths. These small objects are a particularly diagnostic feature of Mesolithic assemblages and appear to have been used as barbs for arrows and a range of other fairly sophisticated composite implements. Figure 1. Mesolithic flint microliths from Banham (NHER 2259). 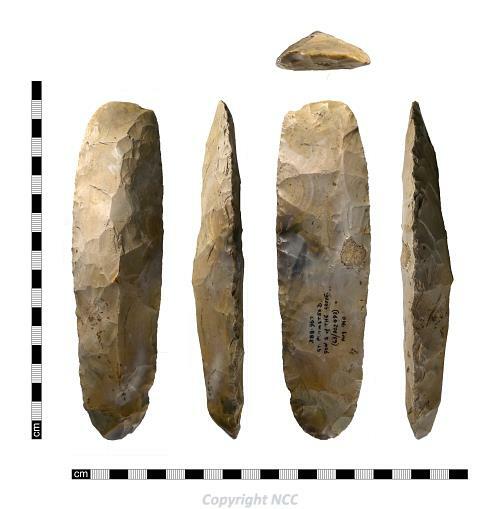 As in later prehistoric periods, a variety of other flint implements was also made, including scrapers, finely serrated blades, and piercing and drilling tools, along with many ad hoc retouched pieces made on both flakes and blades. The Mesolithic also saw a return to the creation of core tools, with a key innovation being the use of hafted axes and adzes – most likely a response to the country’s increasingly wooded landscapes. Many of these implements were skilfully resharpened by transverse blows to the cutting edge, leaving distinctive ‘tranchet’ scars. The ‘tranchet’ sharpening flakes that were detached can be readily distinguished from other flakes. Although these objects are generally referred to as tranchet axes, this is something of misnomer as it appears that the majority were hafted with the cutting edge horizontal and are therefore technically adzes. Figure 2. Mesolithic flint tranchet axehead from Great Plumstead (NHER 10216). As elsewhere Mesolithic findspots and sites in Norfolk are considerably more numerous and widespread than those of the proceeding Final Upper Palaeolithic, suggesting that much more benign conditions of the early Holocene facilitated a more continuous and stable phase of occupation and probably also a significant population expansion. Activity appears to have been focused along the county’s principal valleys, with pronounced concentrations of sites also identified along the west Norfolk Fen-edge and along what is now the north Norfolk coast. As in earlier times, the archaeological evidence is densest in the area around the confluence of the Rivers Tas, Yare and Wensum at Norwich, and around the Wissey embayment and the Little Ouse valley in south-west Norfolk. It should be noted that these concentrations are probably at least partially a reflection of the much greater intensity of fieldwork undertaken in these areas during the last century. Although evidence is generally sparse on the central Norfolk till plain, it should be noted that two of the county’s more significant Mesolithic sites were actually discovered in this area. Ultimately, it is likely that a variety of factors influenced the pattern of Mesolithic activity, many of which will be difficult to assess or fully appreciate at such a coarse, county-wide scale. It is certainly possible to point to several different areas where specific features of the local environment will have made them particularly attractive to Mesolithic populations. A notable example is the clustering of sites on the margins of the Breckland meres, a series of semi-permanent small lakes with naturally fluctuating water levels (see for example NHER 5971 and NHER 8992). It is also likely that the Fenland basin was a focus for Mesolithic activity, although any surviving evidence will now lie beneath the peat deposits that formed as a result of subsequent rises in sea level. The same is probably true of the Broadland region and the lower reaches of the Wensum and Waveney valleys where it is likely that Mesolithic sites are now sealed beneath deposits that were laid down when estuarine conditions prevailed in later periods. The archaeological evidence for Mesolithic activity in Norfolk consists primarily of worked flints, with the material recovered at individual locations ranging from single stray finds to extremely large assemblages comprising thousands of flints. Although many sites have produced assemblages that can be reasonably confidently dated to the Mesolithic, there are a large number of objects that have been assigned either only a tentative Mesolithic date or a broader Mesolithic to Neolithic date range. This is primarily a result of the fact that blade-based industries continued to be prevalent in the Early Neolithic. The distributions of the more diagnostic Mesolithic implements such as microliths and tranchet axeheads do however broadly conform to that of all the Mesolithic and potentially Mesolithic material. There are, however, some notable differences in the distributions of different artefact types, with, for example a pronounced concentration of microliths in south-west Norfolk and a notable increase in the number of Mesolithic core tools in the eastern half of the county. These patterns suggest that the distributions of particular artefact types may reflect, at least in part, an emphasis on certain activities in particular areas, possibly at different times of the year. Mesolithic activity in Norfolk is also represented by a small number of wood, bone and antler objects that have been recovered, although some can be more firmly associated with the period than others. These objects include a small number of barbed bone harpoon tips, excluding examples found at Feltwell (NHER 20981), in dredgings from the River Waveney (NHER 15286) and off the coast at Trimingham (NHER 36533). It should be noted that it has been suggested that Feltwell and Trimingham examples are potentially dubious artefacts. Other objects which have long been seen as having Mesolithic associations are the perforated antler implements generally referred to as antler mattocks or axeheads. At least six such objects have been recovered in Norfolk, the majority along the southern Fen edge. Although radiocarbon dating elsewhere in the country has confirmed that some are indeed Mesolithic, others, including two of the Norfolk examples, have been shown to be of Neolithic or Bronze Age date. Prehistoric wooden objects are extremely rare in the county and none can be confidently associated with Mesolithic activity. At present the likeliest candidate is a broken object from Brettenham with a rectangular section and crudely incised decoration on one side, identified as a possible bow or axe-haft fragment (NHER 5967). Also thought to have possible Mesolithic associations are the perforated stone objects generally referred to as pebble maces or pebble hammers. These objects were made on naturally-rounded stones and, unlike most Neolithic and Bronze Age shaft-hole implements, are generally unmodified apart from their central perforation. The holes were formed by pecking rather than drilling, resulting in a distinctive ‘hour-glass’ perforation. 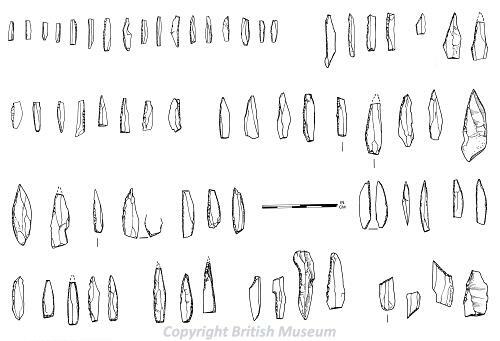 At least 90 of the perforated prehistoric objects found in Norfolk can be reasonably confidently identified as pebble maces, the majority of which had been made from quartz pebbles suggesting that these stones were deliberately selected. Unfortunately as none of these objects was found in stratified contexts or close association with other finds their date remains uncertain, although it is entirely possible that they were produced in more than one period. Figure 4. 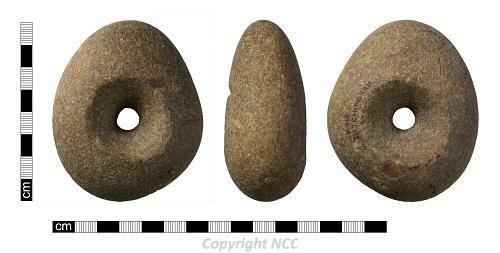 Mesolithic or later quartzite pebble mace from Ditchingham (NHER 10598). Perhaps the most interesting of all the surface scatters identified is that recovered over the course of several decades in the fields surrounding Micklehaugh Farm in Banham (NHER 2259). Several thousand flints have been recovered, a significant proportion of which appear to be Mesolithic, including a number of microliths. In addition over 100 Mesolithic tranchet and non-tranchet axeheads have been recovered, which is by far the largest assemblage from an area this size in Norfolk and quite possibly southern England as a whole. There are now a reasonable number of sites where some form of Mesolithic evidence has been recovered during intrusive archaeological fieldwork. However, in most cases this has been little more than small numbers of worked flints, found either in unstratified contexts or residual in later features. There are, however, a number of sites where more significant Mesolithic assemblages have been recovered during archaeological excavations, several of which deliberately targeted sites where surface scatters had previously been identified. These include the well-known site excavated on Kelling Heath by J.E. Sainty during the 1920s (NHER 6246), which produced many thousands of Mesolithic flints, including numerous microliths. The most significant Mesolithic excavation of recent years took place at Great Melton in 1986–87, following the identification of a substantial surface scatter during fieldwalking. This work saw the near total excavation under controlled conditions of an exceptionally large Mesolithic flint-working scatter, with over 30,000 flints recovered (NHER 16753). Notably, both of these large assemblages were found to survive in relatively undisturbed subsoil contexts. A small trial excavation undertaken within the area of the main surface scatter at Banham also demonstrated that a significant number of flints survived in a fairly undisturbed layer, in spite of significant plough disturbance of the overlying material (NHER 60521). Despite the considerable evidence for Mesolithic activity at these sites, no related archaeologically significant features or deposits were identified. This is unfortunately fairly typical for the county as a whole, with only a small number of excavations having revealed sub-surface features that could be dated as Mesolithic with any degree of confidence. The majority of the features that can be associated with Mesolithic activity appear to have actually been utilised natural features. These include several features that were probably tree-throw holes that were identified during excavations on Spong Hill (NHER 1012), one of which produced a small assemblage of later Mesolithic flint. Radiocarbon dating confirmed that these features were associated with activity taking place during the 8th to 7th millennia BC. Similar features were associated with a later Mesolithic site excavated at Two Mile Bottom near Thetford in 1996 (NHER 5719). One of these hollows was particularly notable, producing over 4,500 worked flints and possible evidence for a hearth at its centre. Such features form part of a growing body of evidence for the fairly commonplace use of tree-throw hollows as temporary working sites and shelters in various prehistoric periods. Although a small number of pits and other features at sites elsewhere have been tentatively suggested as Mesolithic the evidence is far from convincing. It is however possible that we are over-reliant on the presence of large flint assemblages in order to identify Mesolithic features. That we may be underestimating the level of Mesolithic activity on some sites is suggested by the occasional unexpected Mesolithic radiocarbon dates that are obtained for features assumed to relate to later periods of activity. An example of this is Grimes Graves (NHER 5640), where two otherwise undatable hearth-like features produced dates that suggested they were contemporary with a small Mesolithic flint assemblage that had been recognised amongst the mass of later material. 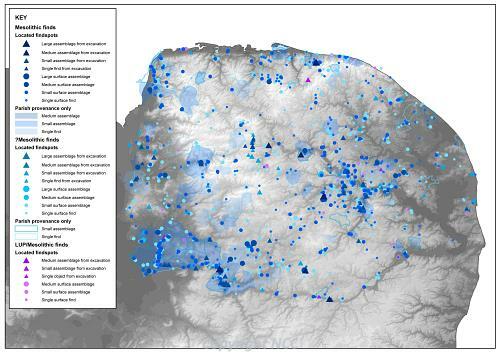 One of the greatest challenges when it comes to attempting to interpret the nature of Mesolithic activity in Norfolk is the poorly dated nature of the majority of sites. This is largely due to the fact that reliable radiocarbon dates are only available for a small number of the county’s Mesolithic sites. This situation is true for much of the rest of the country and as a result the chronology of the period as a whole is not very well understood at present. We therefore continue to be reliant on the relative dating sequences that have been established for several typologically distinct microlith assemblage types. On this basis a number of sites can be identified as almost certainly of Early Mesolithic date, including the significant excavated sites at Kelling and Great Melton. Several sites have also produced distinctive basally retouched microliths that are increasingly seen as representative of a ‘Middle’ Mesolithic. An assemblage recovered at Two Mile Bottom, on the outskirts of Thetford, close to the Little Ouse, has a notable number of these microliths (NHER 5719) and several examples were recovered during an excavation at Scole (NHER 1007). Isolated probable examples are also known from Southacre (NHER 58760), Reffley Wood, King’s Lynn (NHER 5489) and Great Melton (NHER 17473). A number of sites have produced assemblages for which a Late Mesolithic date has been suggested, primarily due to the presence of smaller geometric forms. The most pronounced cluster of such sites is at Two Mile Bottom. Overall it appears that these late microlith forms are comparatively rare, particularly when compared to the number of Early Mesolithic obliquely blunted points which have been recovered. This is almost certainly due in part to differential recovery rates, with the smaller forms much less likely to be recovered during both surface collection and excavation.